There is just not much blog-able stuff going on here. I've been knitting a little on Williamsro and I ripped a sock. As noted earlier, I lost two needles from a sock and just wasn't up to picking up stitches. The last time sock stitches had to be picked up, Stacey was nearby and able to save my sock. However, she is in Texas and I'm a good thousand or more miles north in Wisconsin. This time it just got ripped. Sorry, Cookie, no sock pics this time. This lovely yarn is the yarn I won from Joan. 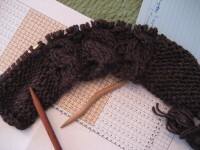 I'll be starting again, probably using Cookie's short-row sock pattern. When I'll start is up for debate. The non-blog-able stuff is distracting me though, really, knitting should relieve stress. A lovely surprise arrived this week's mail. Deborah sent me a Pay It Forward gift. It is a gorgeous bag and will be a well-used bag here at Purling Oaks. She did a wonderful job making this bag. It is lined with a purple/pink fabric. I really needed another sock project bag (see above...needles lost due to the lack of a project bag.) and this is a very classy bag, indeed. Just look at the cool zipper pull! I made it to Curves three times this week. I'm down another pound. Making myself have a smaller "footprint" is progressing slower than I originally planned. However, I'm making progress, so I'm still satisfied that my efforts are moving me the way I want to go. I know the additional exercise is helping me cope with the work-stress I'm encountering. Have a good week, everyone. I mean that. Hey lady! Where's the seed? The snow arrived this morning about seven o'clock this morning and continued to fall all day. I think we received about four or five inches of additional snow today. 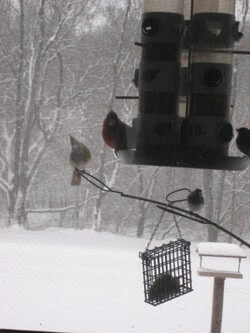 The birds and squirrels visited the bird animal feeders all day. I think these cardinals were wondering if I was going to come outside to top off the feeders this afternoon. On this day of snowy leisure, I cast-on (again) for Williamsro. This time I used size 11 (US) needles (one size down from the pattern's suggested needle size) and I'm close enough to gauge that I'm going to continue on with my sleeve swatch sleeve. Perhaps most everyone that wants to participate in Pay It Foward has all ready found their spot.......but, just in case, I would like to offer up that I still have two openings for my PIF, if you are interested. I'm not worried about filling the slots as I'm planning to present crafty gifts to two folks (with blogs or not) who won't suspect expect it, so I'll be able to fulfill my voluntary obligation during the year. The week is really flying by and it must be more than the wind whisking it along. I wore my winter boots for the first time this season today. The bit of snow this morning made things a bit wet and I must admit my ankles appreciated the warmth since my attire included a skirt today. Today I was informed that instead of traveling to Eau Claire next week, I will be teleworking. Somebody up there loves me! Teleworking saves me (personally) an hour or two each day by not having to drive somewhere! Plus, I'll be home! Just think...more knitting, sewing, err, and more exercise.